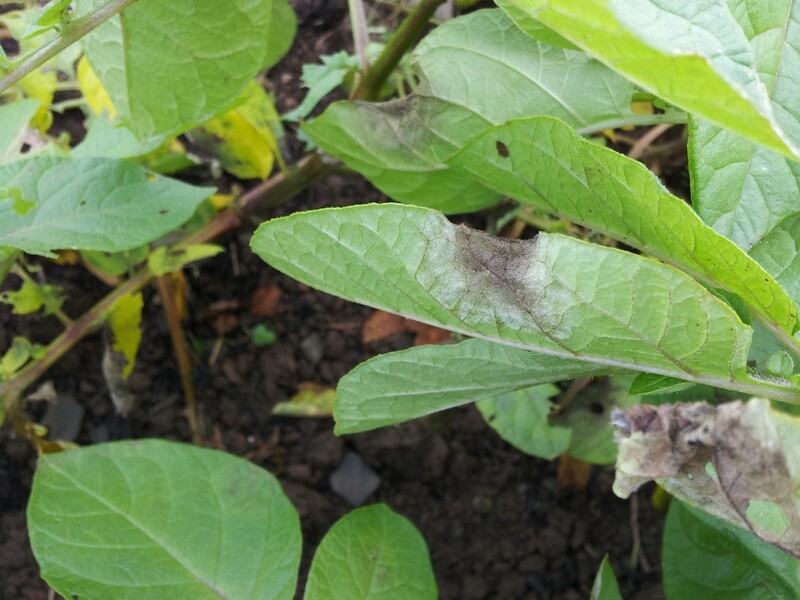 Here we are, almost at the end of August and three months after first being alerted, still hearing potato blight warnings in Ireland. Not surprising really given the damp warm conditions Ireland has been under for many weeks, but if you’re growing potatoes or tomatoes it’s imperative you keep vigilant. Blight is tricky to control organically and there’s a lot of confusion about what home growers are ‘allowed’ to use or not. A couple of years ago I was informed that I could use copper sulphate, which was available as Bluestone in most chemists and that I could make up my own Burgundy mixture (a mix of copper sulphate, washing soda & water). However, on enquiry at the local pharmacy I was told that they were no longer allowed to sell Bluestone and that it was illegal to make up my own solution, so that scuppered that idea. 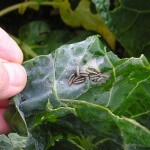 What can organic growers do to prevent blight affecting crops? Blight is a parasitic fungus (Phytophthora infestans) that usually attacks in the summer months in humid conditions and is carried on the wind. It can attack leaves, stems and tubers and can also cause Tomato Blight as tomatoes and potatoes are in the same (Solanacea) family. The method that has been the most effective in my experience is to plant resistant varieties. Sarpo Miras (an early maincrop), Sarpa Axona (maincrop) and Blue Danube (early maincrop) all show excellent blight resistance. Setanta (maincrop) and Orla (early) are Irish varieties that have shown good resistance too. Planting early crops of potatoes (new potatoes) will help as the idea is that they will have matured before blight warnings are issued. However, in 2011 warnings were issued mid-May so that can’t always be guaranteed. 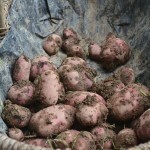 Keep earthing up potatoes as they grow (bringing the soil up around the stems). This will help to protect the potato tubers in the ground should blight attack. 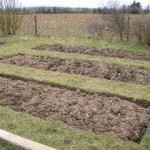 When placing the seed potatoes into the soil, use the maximum spacing suggested. This will ensure there’s an airflow between growing plants. Good hygiene. 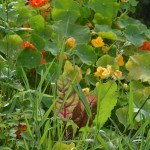 Ensure beds are as weed free as possible. Vigilance. If you notice blight on the leaves, cut the stems at ground level leaving the tubers in the ground for at least ten days before moving them. Unless you have a really hot compost system, you will need to move the foliage away from your site, disposing of it safely. 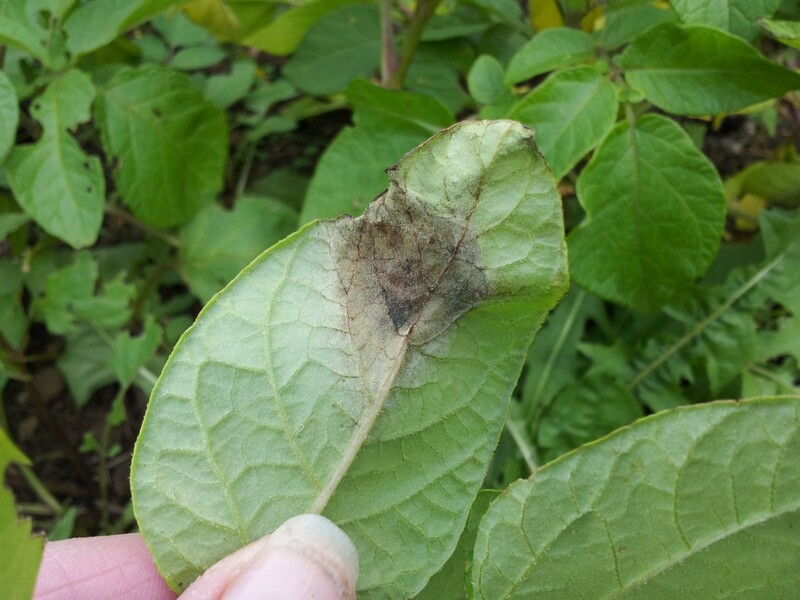 Blight is often recognised by a white furry ring on the underside of leaves that outlines the brown splodge (see top picture). worked, Bordeaux Mixture is approved for organic use and can be sprayed onto your crops. (Thanks to @KathyMarsh for the update: Under Irish organic standards you may use up to 6kg per hectare per year. You no longer have to ask permission but must record why you used it.) This is a preventative measure however and should be sprayed before the risk of blight. It’ll be no good whatsoever spraying it on afterwards. 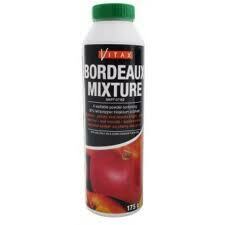 Bordeaux Mixture is available from good garden centres or online. It’s difficult to talk about blight without mentioning the GM potato trials that will going on in Teagasc at Oak Park, Carlow that many of us alarmed by the increase in GM crops are nervous about. I’ve written about GM in previous posts and here’s a link to an excellent article in thejournal.ie explaining that GM crops aren’t just about the science – they’re about the politics. 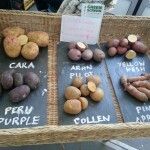 www.spuds.ie are running an awareness campaign to educate the public about the availability of naturally blight resistant varieties that are available in Ireland. If you’d like to find out more about what they’re doing, please head over to their website, sign up for their newsletter and show them some support. Have your crops been affected by blight this year? Did you find that planting resistant varieties has helped? 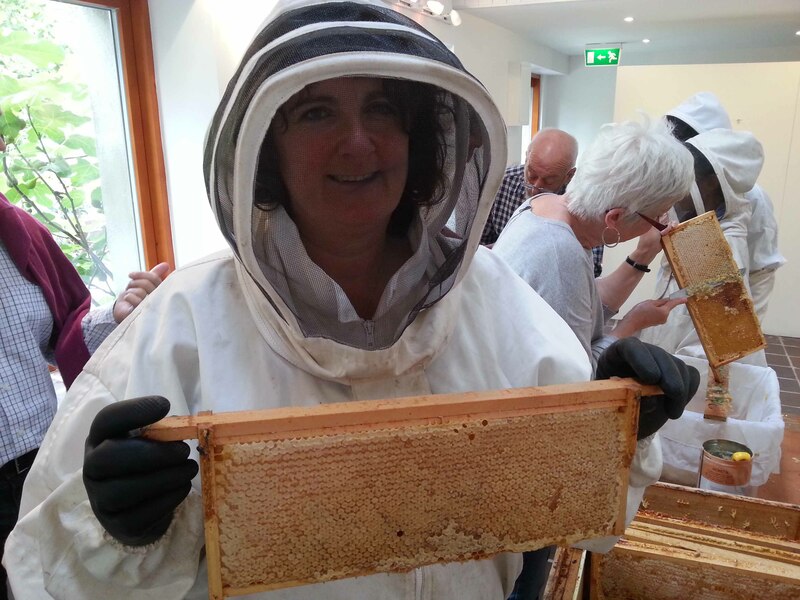 Gardening – all work and no play? Not on your life!